UPDATE: WE HAVE OUR WINNERS! Kelly Dolinger, Christy McNeal, and Heather Clemons, please check your email for details on how to claim your prize. Congrats, and thanks to everyone else who entered! 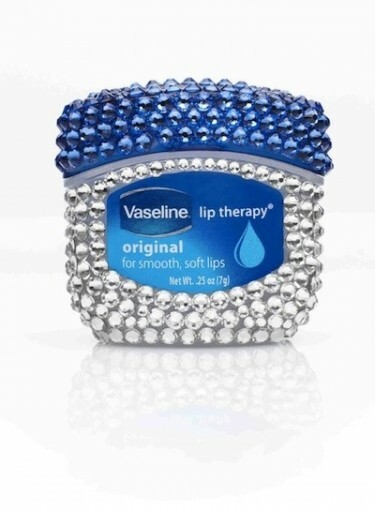 Bravo star and costume designer Chris March has collaborated with Vaseline to design a limited-edition bejeweled Vaseline Lip Therapy jar. It’s customized with nearly $50 of Swarovski crystals, and it’s filled with the same petroleum jelly you know and love. Giveaway details: We’re giving away THREE of these jars to three lucky readers. It’s cute enough to give as a stocking stuffer, but we wouldn’t blame you if you kept it for yourself. To enter for your chance to win one of the jars, just leave a comment below or on our Facebook page with your name and email address (for contacting purposes only). However, if you don’t win this giveaway, you can go to www.vaselineliptherapy.com on 12/19 at 5pm PST for a one-day flash giveaway of the special Swarovski jars (they’re only selling 100 of them). Good luck!